I can't remember when I came up with this idea exactly. I just remember being fed up with a certain behavior and I wanted to figure out a way to reward positively for the right behavior. The idea at first, was that Lachlan would get a badge at the end of the day. When Daddy came home from work, he would ask if Lachlan had listened well and ask if he had gone to time out at all that day. I wanted Daddy to be involved in the reward process. This worked great for the first day or two, but then we started to forget. The badge was also so delayed and separate from the good behavior that it really didn't matter much at that point. So it evolved. They each now have a badge jar out in our living room. The third jar holds all the badges that are up for grabs. When we see them act out a good behavior, we ask them to put a badge in their jar. This is great, because they immediately get a reward. 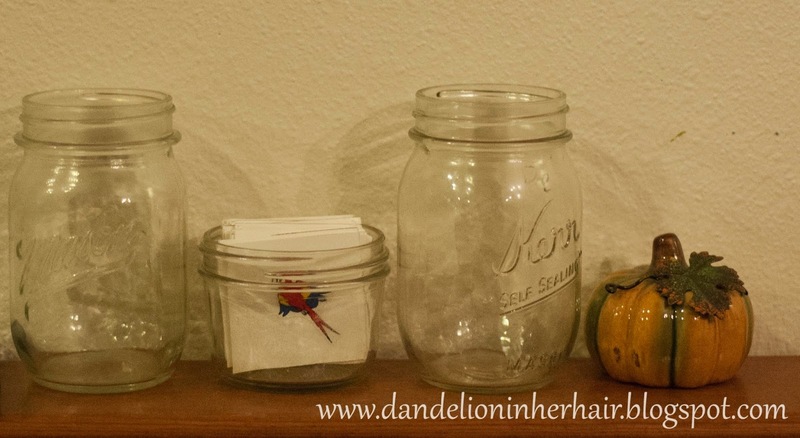 The badge jars in the living room. Each of my sons have their own behavior that they get rewarded for. Peter get's a badge for listening because, well, he's not that great of a listener. Lachlan get's a badge for controlling his anger. He has always been quick to get frustrated and angry. I remember when he was tiny, the doctor asked if he could stack blocks. He was checking to see if Lachlan had met a developmental marker. I thought, hmm, no he can't because when he stacks more than one, if it falls over, he get's so mad he crashes the rest down. Poor guy, wants to get everything just right. He struggled with taking instruction from Mommy, for this same reason. He thought he should already know everything and was upset that he didn't get it right. This proved to be especially problematic since we homeschool. So he also earns a badge for taking instruction. This will be their third time filling up the chart, and this time around, we are adding 'going to bed with out Daddy' to the badge earning list. Somewhat unintentionally, we have used it as a negative consequence to bad behavior. If they don't listen or don't control their anger, a badge can be taken away. For this reason, I will give them a badge each morning, that way it is their goal to keep their badge as well as earn more. Even though taking away a badge works, I really try to keep this a positive reward system. As they head off to bed each night, we take their badges from the jars and put them in the badge chart. This way, at the end of their day, they can see how many they have earned and also see how close they have come to filling up the chart. When the whole chart is full, we get to go do something fun as a family. As we were driving home from the 3D movie they earned tonight, it dawned on me that their are a few more big time perks to this set up and their reward. First off, they are each earning the badges separately, but all the badges go into the same chart. This means, that they, as a family, are working together towards the reward. Also, the reward is enjoyed together, as a family. The reward is not an object, but an experience. (Big positive for my house, as I do not need anymore stuff.) It's also most likely an experience we would do and pay for anyhow, but when done as a reward, makes it that much sweeter. Their first reward earned was a trip to an awesome pool with a water slide and all sorts of fun. So let me break down the parts. The 'badge chart' is a pocket chart. We got ours from a friend who picked it up second hand. But these things are used everyday in classrooms across America and can be purchased at any school supply store and I am sure can be ordered through Amazon. Sure enough, I was able to find one on Amazon. I guess it's a 100 board pocket chart. At first it was just Lachlan earning badges and we didn't want it to take forever for him to earn his reward, so we folded the pocket chart in half and stapled it along the edges. So there are only 50 exposed pockets to fill. 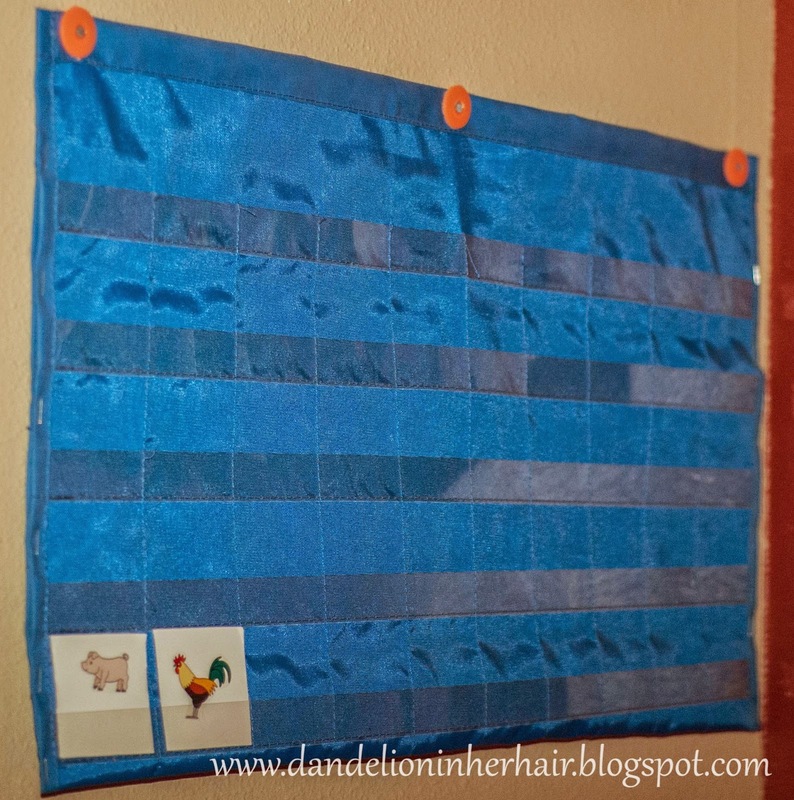 I might add another row or two to make it 60 or 70 pockets to fill now that 2 boys are contributing to the chart. The badges are simply poster board cut up into squares. I had the boys help me add the stickers to the squares to turn them into badges. We used stickers from an awesome Melissa & Doug set we happened to have. But of course you can buy stickers of your childs favorite things and make the badges meaningful to them.